I’m saying that without the conscious perspective of the artist, the art piece would not be made available to other perspectives and left up to interpretation (perception). Furthermore, as human beings we are all walking around creating art. Everyday. We do this everyday as we take in information. As we attempt to make sense of the world. Consequently, we do this everyday as we experience others doing the same thing. Moreover, we do it when we conceptualize someone else’s experience and as a result react to it. The human experience of suffering can be understood in terms of art and consciousness. This post by Christopher Chase really delves in what it means to connect art and consciousness. As I read it I couldn’t help but think that if people were more awake- more aware of what is influencing their lives, so much would be different. In a really positive way, too. Moreover, I couldn’t help but to think about the many patients that I come across who are having difficulty coping in their lives because of the way that other people go about creating their own. My biggest takeaways? There is hope. Also, being mindful, and intentional about your thoughts, will undoubtedly change your experience of life and make it more positive. In addition, it is so important to be aware of how and what you let influence you. Because what you choose to practice and fixate on can really sway your energy. Hopefully in a positive direction. This will then free your energy up to create positive life experiences. Honestly, those are the types of experiences which are bound to have ripple effects on humanity as a whole. Remember, we are one fluid stream of consciousness divided among human vessels. Throughout it all, I’ve wanted to get one thing across. It is that those who are suffering among us, would suffer less if we were more aware of what it truly means to have consciousness. It is imperative that consciousness is understood to be the perpetual creation of the never ending cycle of perception being influenced by perspective. This humbling stance has the potential to make life on earth more pleasant for everyone. Why? Because we will understand that we are in fact more in control than we think we are. Ultimately, this includes our own mental health and the mental health of those among us. 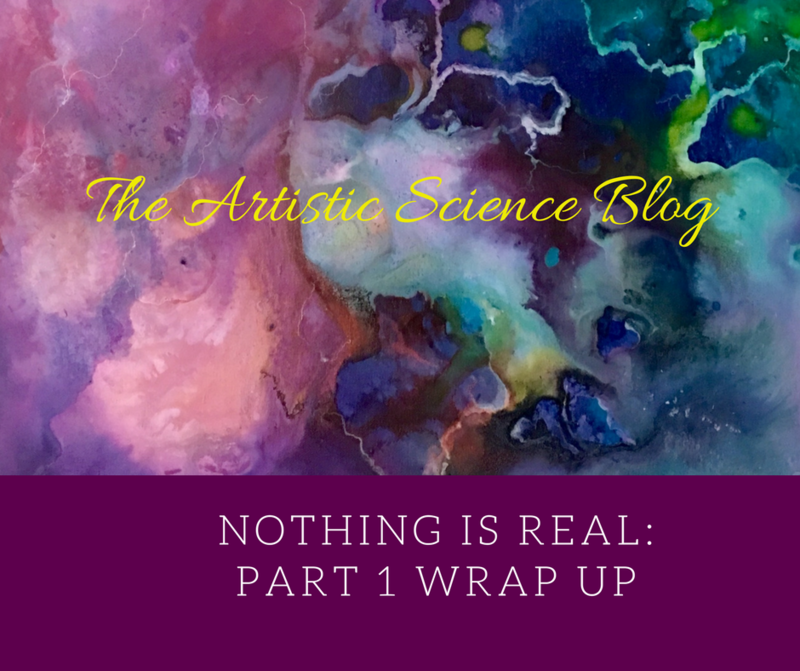 In closing, read more of the blog post which inspired the wrap up to Part 1 of the Nothing is Real Series below. Essentially, it inspired me to continue to think outside of the box. Really, if you think about it, there is no box. Art is surely consistent in teaching us this. And so is life. We just have to be willing to see it, in a way that allows us to be the best version of ourselves that we can be.